Following his release by the Ravens in March and a visit to Buffalo last month, cornerback Shareece Wright and the Bills agreed terms on a contract this morning. Having drafted former LSU cornerback Tre’Davious White Thursday night, the Bills will likely look to Wright to provide some needed experience within Buffalo’s young CB group, having lost Stephon Gilmore to the Patriots in free agency. 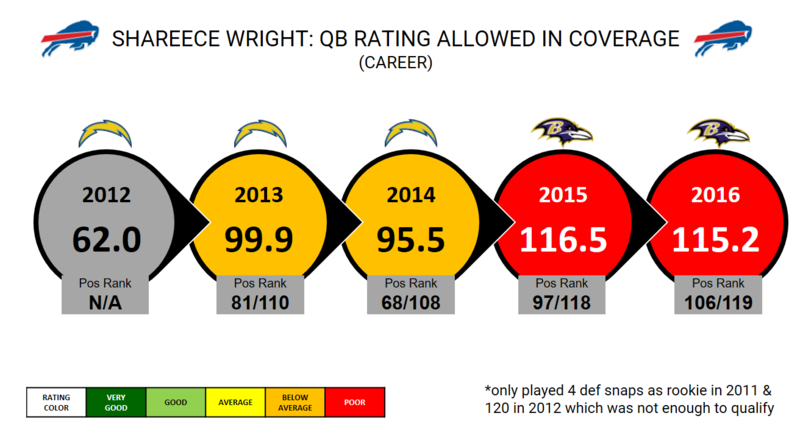 Last season, Wright ranked 75th among qualified CBs with an overall grade of 66.0 in 2016; Wright ranked 53rd in 2015 with a 73.1 overall grade, his highest mark over the past four seasons. He ranked 21st among CBs with a run-defense grade of 77.3 in the 2016 season. He was 16th with a 2.1 run-stop percentage. Wright has regressed in terms of QB rating allowed into his coverage since entering the league; he ranked 106th out of 119 qualified CBs by allowing a QB rating of 115.2 last season. Wright brings much needed-experience with his 3,114 career snaps, a mark that will lead the Bills entering the 2017 season.